Considered one of the eight most life threatening places on the planet, Minqin in north-west China is sandwiched between the two expanding deserts Tengri and Badain Jaran. Many people here have been forced to abandon their homes since heavier deadly sand clouds from the mighty Gobi desert increase as the climate gets warmer. We barely have time to jump off the train in Wuwei before being bundled into the care of director Zhang and his co-workers from the Wuwei Regional Water Bureau. During dinner director Zhang quickly comes to his present concern, the water level has fallen by more than three metres in the last 30 years. Less than 20 percent of the water in Minqin comes from melting snow and glaciers, the rest from harvested rain water in artificial reservoirs. Rivers that previously poured through the area are now completely empty of water all year round. According to Zhang, water management has improved the situation. Three years ago, all who live in the area have to abide to strict water rationing. “Inside the city, each family can use 130 litres per day. If they use 30 percent more they have to pay twice as much,” says Dr. Zhang. “There is of course a major concern for the future,” he adds casting a glance round the table while finishing his glass of water. We are collected devastatingly early next morning by Mr. Jang, director Zhang’s personal driver. On the way to the desert line we make a short stop at the Hongyashan reservoir, at 25 square kilometres it is the largest in Asia built in a desert area. “If it rained a lot they would put some water back into the rivers, but they remain dry these years. Channels that were built during Chairman Mao's time in the late 1950s ‘Great Leap Forward’ are used to provide farmers with water from the reservoir”, tells Jang. He continues to state that if nothing had been done to manage the water, more of this area would be desert. "No one would have enough water." Life in the dryness rolls by outside the window, a constant stream of villages battling to survive in the arid landscape. In the blink of an eye the same style villages are suddenly lifeless and buried in sand, we have reached the desert line. As stark a contrast as a train coming out of a tunnel, from dark to light, within seconds the car windows are closed to stop blasting sand getting in. Appearing out of the dunes lie buried memories of previous experiments to try to stop the desert from spreading further. Asphalt, small enclosures made of green mesh networks and straw have been attempted, but nothing seems to help in the long run. Asphalt did work quite well on some sand dunes, but nobody seriously considers turning the entire desert area of China into a parking lot. In Minqin there is also a special laboratory where they are trying to grow plants that can survive in desert areas. Despite all these attempts the desert creeps closer each year. More than 160 square kilometres of land have been lost since 1950 and during the same period the population of the area has doubled, from 860 000 to over two million people. Jang pulls the car into a wreck of a village that looks slightly inhabited. The car becomes filled with nervous excitement. Knock. A policeman answers the door telling us that no one lives here permanently any more, the police rent the place as a look out base for officers, he knew nothing of Ye Yinxin. We make a short stop in another village before continuing. The sand is pouring and the visibility drops. A feeling of emptiness comes to pass, as if life ended here. Five men on a motorcycles see us quizzing the lonely structure, they are from the nearest village beyond the desert border. Some of them will continue to Inner Mongolia to get cheep coal, others are at the former lake to collect desert onion. One of them is Mr. Pan. 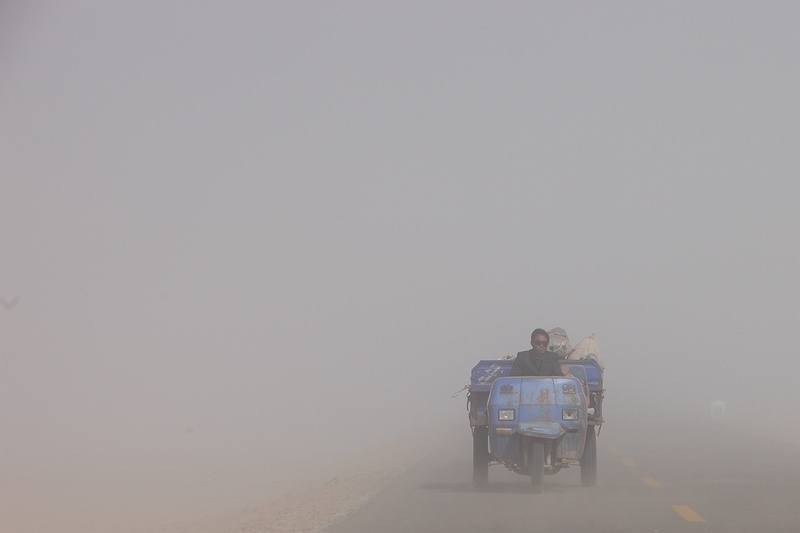 “Sandstorms have become much more frequent in recent years, the ones in spring can be deadly. If the water continues to decline, we’ll be forced to stop growing our best cash crop corn, it needs large amounts of water. We all hope that the water will rise in the future, we need it to,"he says interrupted by the increasing wind. The group quickly disbands as we jump into the car taking cover from the piercing grains of sand. We head back towards Wuwei.